The most expensive statue in Coventry's history will be unveiled later this week (Friday). 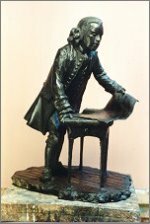 A bronze image of great 18th Century canal engineer James Brindley by world-renowned sculptor James Butler will form the focal point of the Canal Basin and is the largest single project in the Canal Art Trail. Butler, who works from his studio at Radway in south Warwickshire was commissioned to undertake the £40,000 work by environmental and regeneration trust Groundwork Coventry. It has taken him a year to complete the bronze Brindley statue, which is one and a quarter life size and weighs half a ton. It will be sited between the forks of the Coventry Canal looking towards a bridge designed by Brindley. The statue was commissioned as part of the £1 million Coventry Canal Corridor scheme and supported by National Lottery money and a grant from the Elizabeth Frampton Fund, which donates up to £10,000 a year for bronze sculptures. "It has been an immensely enjoyable project and I am looking forward to seeing the piece in place on Friday. There couldn't be a more appropriate place for a statue of Brindley and I am very pleased to be involved. "I had never been to the Canal Basin before but it is a wonderful place which has been very well restored. The canal is like a green ribbon that runs through areas of extreme industrial importance and the Canal Art Trail is a splendid scheme that has allowed artists and local people to contribute to improving the environment. I think Groundwork and the City Council should be congratulated." The Brindley statue is the fifteenth Canal Art Trail project to be completed. The trail leads from the Basin to Hawkesbury Junction to the north of the city and features works by commissioned artists and local people. "The Brindley statue will be a wonderful addition to the city. James Butler has not just undertaken the work, but has also been into local schools to talk about sculpture and generally supported the Canal Art Trail. "He has an extremely high reputation in the art world and the fact that he lives in Warwickshire is a bonus. "The whole canal has been transformed by the Coventry Canal Corridor scheme. Towpath access has been improved, the canal itself has been cleaned, green areas have been created and signage improved. "The canal played a major role in the history of the industrial city but it had reached a sorry state. The project, of which the Canal Art Trail forms a part, has brought it back to life for the benefit of, and often thanks to, local people. "The scheme has been funded by Coventry City Council, the Governments Single Regeneration Budget, the European Regeneration Fund and corporate donations. It has been a partnership in the true sense of the word." Groundwork Coventry was formed three years ago and is one of over 40 similar trusts around the country. It aims to bring about sustainable improvements through partnerships, to the local environment and contribute to economic and social regeneration.